It is just SO fantastic to be back out in the Serengeti! No matter how many times you have been there – and for how many years you have been going – you still forget the sense of endless space, what a raw force of nature in the place has. 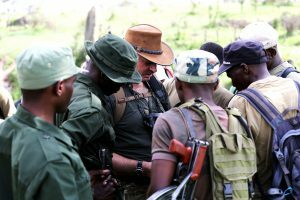 This trip out was a little different; the aim was to polish the walking safari skills of nine of our guides and five National Park Rangers. 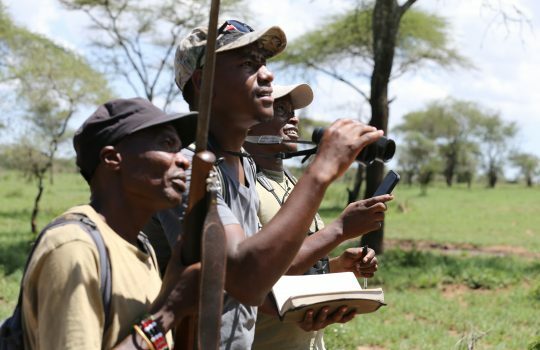 Quite a team we had, lots of knowledge and many more years of bush experience than I could even count – the birding competition almost reached Olympic standards – and the enthusiasm to learn was just as exciting. The aim was to give them a chance to update walking guide skills – from the pre-walk client briefing (a tightrope between covering all the safety points and scaring the living daylights out of everyone!) to managing the clients on the walk – and give them more confidence in practical situations. There were plenty of fun simulations as we perfected leaping out of the bushes pretending to be a buffalo or lion – not before we went round and collected everyone’s bullets mind you! – testing how everyone reacts and how on earth you control panicking clients! We had some great walks and wonderful wildlife, from sneaking up on a herd of elephants to the slightly easier dung beetles, wandering down sand riverbeds and clambering kopjes. Every trip to the Serengeti is a treasure and an adventure! And it certainly doesn’t have to be stock-standard. Even with our guides, we make a point of going to a different part of the exclusive Wilderness Area of the National Park every trip so it’s new and exciting for them too. Don’t worry, with vast areas that haven’t seen a human for more than 60 years there is still plenty of exploring to do.